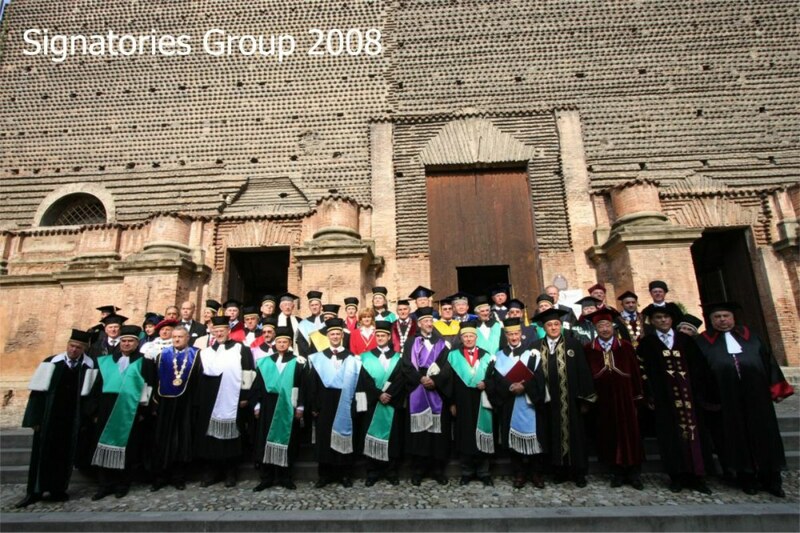 On 18 September 1988, on the occasion of the 900th anniversary of the University of Bologna, 388 Rectors of universities from all over Europe and beyond gathered in Bologna to sign the Magna Charta Universitatum. For the first time, they confirmed the importance of the fundamental principles and values of the University. Soon, this document became a milestone for the understanding of higher education. In order to mark this historic event, the Magna Charta Observatory organised the annual conference to celebrate the 20th anniversary of the Magna Charta Universitatum, looking both at the past and the future. The Magna Charta Universitatum – despite its European origins – has developed into a globally accepted declaration of the academic tradition. Josep Bricall and Fabio Roversi-Monaco, who both were amongst the originals writers of the Magna Charta Universitatum, provided an overview of the developments of the University until the most recent challenges. The President of the Republic of Slovenia, Danilo Türk, gave a keynote speech on the importance of institutional autonomy and academic freedom for the development of society in economic, cultural, scientific, technological and social aspects. The Magna Charta Observatory had organised a series of meetings in preparation of the anniversary event to discuss the future of the university. As a result of those meetings, Jon Torfi Jonasson wrote an essay, which he presented during the conference. Martina Vukasovic from the Centre for Educational Policy in Belgrade and Eva Egron-Polak, Secretary General of the International Association of Universities, commented on the essay during the conference. Whilst the values laid out in the Magna Charta Universitatum are the same, universities are operating in different contexts. Therefore, presentations from the North America, Latin America, Central Asia, Africa and the Middle East provided an overview about the challenges in the respective regions. Further interventions were made by Ligia Deca, Chairperson of the European Students’ Union, Sjur Bergan, Head of the Higher Education Division at the Council of Europe, Robert Quinn, Director of the Scholars at Risk Network and Georges Haddad, Director of the Higher Education Division at UNESCO. The conference brought together more than 300 people from all over the world, representing their universities and international organisations. The presentations can be found in the Proceedings of the conference.